Acclaimed as a cultural leader and the seminal figure in establishing the East Kimberley School, Rover Thomas holds a primary place in the history of Aboriginal art. He was born in Walmatjarri-Kukaja country near Well 33 on the Canning Stock Route and did not begin painting until in his fifties, having spent 40 years as a stockman droving cattle between Queensland and the Kimberley coast. During the Christmas of 1974, a year before Rover settled at Warmun, Cyclone Tracy laid waste to Darwin. Many Aborigines saw this cataclysmic event as a sign that their culture and traditions needed strengthening. A powerful dream, involving the spirit of Rover’s dead aunt, inspired Thomas to create a song and dance cycle that evolved into the Krill Krill ceremony. The spirit had described the details of a journey that she had undertaken after her death. In Rover’s re-visitation of that dream he too saw the places and the characters involved in the saga she encountered during her travels. At the end of the song cycle the travelling spirits look from Wyndham, across the waters to the northeast, and witness the Rainbow Serpent’s vengeful destruction of the Territory capital. The ceremonial reenactment of this dream took place for the first time in 1977 and was repeated at a number of locations in the East Kimberley region, in Arnhem Land, and further afield through the late 1970’s and early 1980’s. During the ceremony painted boards, depicting the important sites and spirit beings were carried on the shoulders of the participants. These boards evolved into what is referred to today as the East Kimberley style. They are familiarly characterized by an aerial perspective in common with Central and Western desert art, however they can include literal figurative elements and topographical profiles. Rover collaborated on these early boards until 1981 when he began to paint as an individual in his own right. The original boards, made only for the corroboree, had been painted in earth pigments on housing debris, pieces of Formica, wall panelling and wood from old packing cases. By 1983 Rover worked almost exclusively for Mary Macha who provided him with plywood boards on which to paint. He visited Perth in 1984 and painted at her home in Subiaco where she converted her garage into a studio. Exhibitions organized by the Art Gallery of Western Australia and the National Gallery of Australia followed along with his selection as one of Australia’s two representatives at the Venice Biennale in 1990. These events as well as his recognition on winning the John McCaughey prize all increased his national and international prominence and generated the ever-growing number of agents and galleries who sought to represent him. During the following two decades and until his death in 1998, Rover Thomas developed his art practice and worked for a number of independent dealers and art centres including Warmun Traditional Artists, Waringarri Arts and the Warmun Art Centre which opened during the year he passed away. His works can be contemplative and sombre drawing the viewer into spacious planes of painterly applied and textured ochre. White or black dots serve only to create emphasis or to draw the eye along pathways of time and movement, following the forms of the land in which important events are encoded. In many of his works the predominant use of black conveys a startling, strangely emotional, intensity. Warm and earthy ochres, and a palpable sense of spirituality, invite the viewer on the one hand, to consider the unfolding of important events, while at the same time, purposefully sustain the viewer in an ancient and timeless landscape. Rover is widely credited as being the first Aboriginal artist whose work could sell in the primary market for more than $10,000. They first appeared on the secondary market in 1993 when the single work offered sold for $3,300. Since that time no less than 350 works have appeared for sale of which 69% have sold at a staggering average price of $60,676. His highest price held the record for any Australian Aboriginal artwork between 2001 and 2007. All That Big Rain Coming from the Top Side 1991, a 180 x 120 cm canvas, sold at Sotheby’s for $778,750 against a presale estimate of $280,000-350,000 in July 2001 (Lot 66) to the National Gallery of Australia. It was finally being eclipsed in 2007 by Emily Kngwarreye’s Earth’s Creation, 1995 and later Clifford Possum Tjapaltjarri’s Warlugulong, 1977. The work illustrated above is a particularly fine example of Rover’s late career work. Measuring 120 x 120 cm. the layering of pigment imparts a beautiful luxurious earthy surface creating a complexity that belies the work’s minimal aesthetic. The subject is Nilah Marudj an important site in Rover’s Country. It was created in 1996 for Narrangunny Art Traders, the trading name used by Maxine Taylor and Terry Brooks who became the first art coordinators in the community during the following year. Once established in its current location the art centre under Taylor and Brooks operated as Warmun Traditional Artists until 1999 when a new constitution and incorporation led to the current Warmun Art Centre. Rover Thomas died on April 11, 1998 and was posthumously awarded an honorary doctorate from the University of Western Australia. The power of his work was reflected in the attention it commanded from the beginning of his 20-year career. Since first exhibiting in 1987 there has been a constant demand for his paintings, which are now represented in all major galleries in Australia. He is recognized as the major figure in contemporary Australian Aboriginal art. 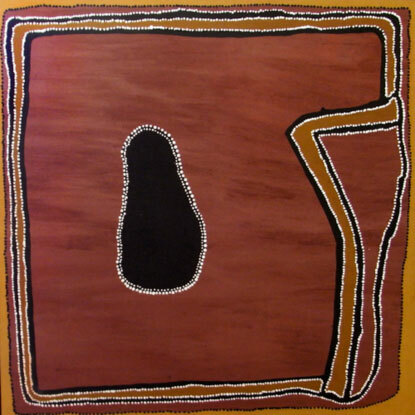 His legacy is a substantial body of significant paintings that provide an enduring, unique, insight into the numinous landscape of the Kimberley region and the human relationships and events that have become part of it.